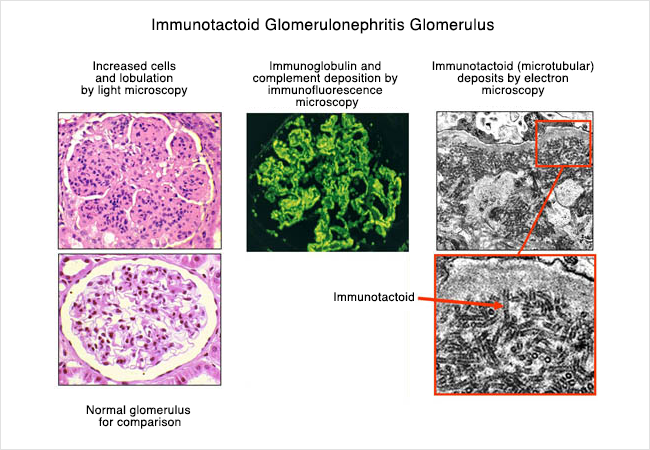 Immunotactoid glomerulopathy is a disease process which interferes with the normal function of your kidneys. The name comes from “immuno” which means related to the immune system, and “tactoid” which means a group of rod-like structures. Cells from your immune system produce antibodies which normally help to fight infections. In this disease, these antibodies are abnormally deposited in the kidneys. This results in the formation of unique rod-like arrays (tactoids). These can be seen using special microscopes. Glomerulopathy means that the disease involves the small, filtering units of the kidney, called glomeruli. The glomeruli filter the blood to produce urine. This is composed of waste products and excess water from the body. This is similar to a water filter that traps impurities in the water to produce clean water. In contrast, the kidneys “clean” the blood by allowing the waste products to pass through its filters into the urine. Most of the helpful and important substances in the blood cannot pass through these filters. They remain in the bloodstream. Both cells and proteins are important in forming a normal filtration barrier in the kidney filters. Normally, the filtration barrier prevents proteins from getting into the urine. The barrier keeps the proteins in the blood. When the filter is damaged, proteins are able to cross the filter and enter the urine. This is similar to the situation when a coffee filter has a hole in it allowing coffee grinds to pass through the filter into the coffee. The loss of protein in your urine may lead to symptoms such as swelling of your feet and ankles and nephrotic syndrome. The diagnosis of this disease requires kidney biopsy. A small sample of the kidney is taken and analyzed by special physicians called pathologists. Using different microscopes, these physicians are able to view the different cells and structures in the kidney. Light microscopy magnifies the kidney about 10 to 100 times. It allows visualization of the kidney filters and the various cell types. Biopsies from patients with this disease have a variable appearance under the microscope. It may appear very similar to other kidney diseases. Many kidney diseases can be diagnosed by light microscopy alone. But the diagnosis of this disease requires a much more powerful microscope called an electron microscope. Its magnification is usually 10,000 times or greater. Using electron microscopy, this disease demonstrates a very distinct pattern of groups of rod-like structures. They are arranged in lines, similar to a stack of pipes or logs. The rod-like structures are called microtubular structures. They appear “hollow” in the center. Some evidence suggests that these rod-like structures contain immunoglobulins. Special stains can detect the presence of those immunoglobulins in the kidney biopsies from patients with this disease. The exact cause of this disease remains unknown. It is an extremely rare disease and is found in less than 1 in 100 kidney biopsies. Most individuals are over 50 years old. Many patients with this disease also have a lymphoproliferative disease. This is an abnormal growth of certain cells of the immune system. Both leukemias and lymphomas have been found in patients with this disease. The abnormal growth of lymphocytes often leads to increased produced of immunoglobulins. These are then deposited in the kidney causing damage to the kidney filters. Ultimately, kidney failure can occur. Therefore, your physician may order additional tests to see if you have a lymphoproliferative disease. Patients usually have protein in the urine at the time of diagnosis. They often have nephrotic syndrome. The protein in the urine may lead to swelling of the legs and ankles. Patients usually have some degree of kidney dysfunction. There is also high blood pressure (or hypertension) at the time of diagnosis. Some patients have a small number of red blood cells in their urine which can be found using a microscope. Patients with a lymphoproliferative disease may also have additional systemic symptoms related to the disease. These symptoms include fatigue, weight loss, or easy bleeding/bruising. There is no single effective treatment at this time. Patients with an associated lymphoproliferative disease are usually treated by a physician specializing in blood cells and cancers of those cells. This doctor is called a hematologist/oncologist. Those patients are usually treated with chemotherapy and treatment of the related disease may improve kidney function. Patients without a lymphoproliferative disease are often treated with medications that affect the immune system function. They are also treated with medications that kill immune cells (called cytotoxic agents). However, many patients do not improve with these therapies. They can develop progressive kidney failure. Physicians continue to study new treatment options for patients with this disease. As the damage to the kidney filters continues, it interferes with the kidneys’ ability to remove waste products and excess fluid from the body. Most patients diagnosed with this disease have some degree of kidney dysfunction at the time of diagnosis. It is called chronic kidney disease. When most of the filters are damaged, the kidneys can no longer effectively filter the waste products. Patients develop end-stage kidney disease (ESKD). The course of the disease is difficult to predict, but some studies suggest that 50% of patients will have ESKD by 5 years after diagnosis. Patients with ESKD require kidney replacement therapy. The choices are either dialysis or kidney transplantation. Patients with this disease have been successfully transplanted. The disease may recur in the transplanted kidney. However, the degree and rate of recurrence remains unclear due to the rarity of this disease.